TLP-IASbaba - Day 66 – Q 1. What is Doctrine of ‘Pith and Substance’? 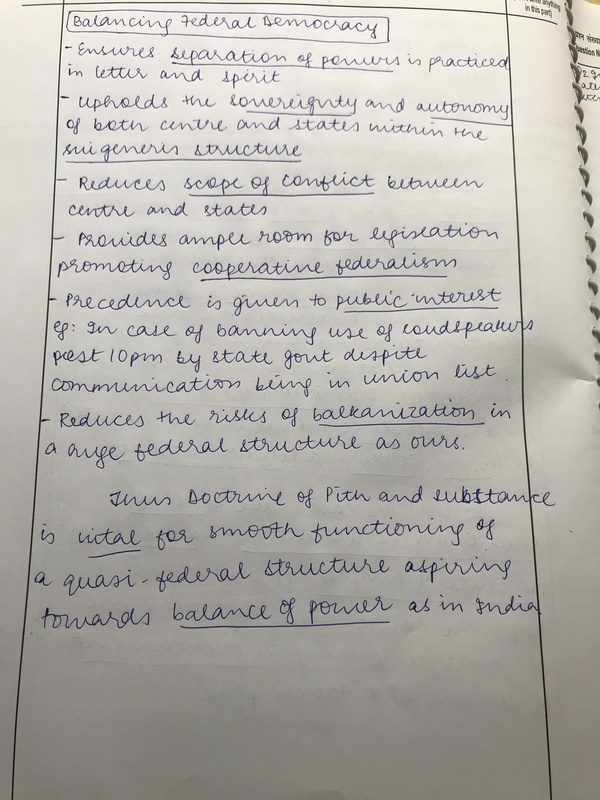 How is it helpful in maintaining a balance in a large federal democracy like India? Day 66 – Q 1. What is Doctrine of ‘Pith and Substance’? How is it helpful in maintaining a balance in a large federal democracy like India? 1. What is Doctrine of ‘Pith and Substance’? How is it helpful in maintaining a balance in a large federal democracy like India? Doctrine of Pith and Substance says that where the question arises of determining whether a particular law relates to a particular subject (mentioned in one List or another), the court looks to the substance of the matter. Pith means ‘true nature’ or ‘essence of something’ and Substance means ‘the most important or essential part of something’. If the substance falls within Union List, then the incidental encroachment by the law on the State List does not make it invalid. The doctrine has been applied in India also to provide a degree of flexibility in the otherwise rigid scheme of distribution of powers. It is important to ascertain the true nature and character of legislation for the purpose of determining the List under which it falls. 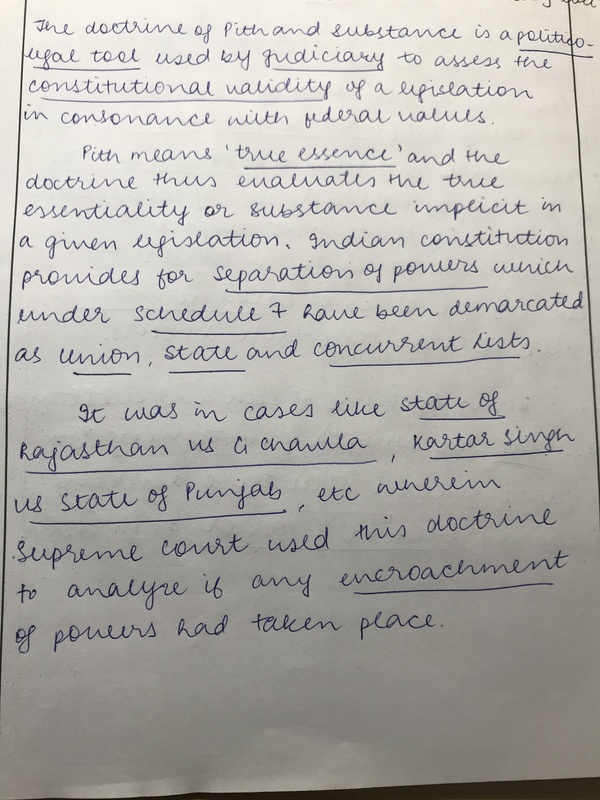 This doctrine is widely used when deciding whether a state is within its rights to create a statute that involves a subject mentioned in Union List of the Constitution. It helps to keep in check overlapping of executive powers. Taxation powers of the feral government stay within their own domain. Upholds sovereignty and autonomy of both central and state governments. Promotes cooperative federalism by giving enough space of legislation for both governments. The doctrine has been applied in several instances to hold the true spirit of the law framed by state government while preserving the sovereignty of the Central government. It thus helps maintain the federal balance in the Indian scheme of things. Mains 2018: How IASbaba Helped!